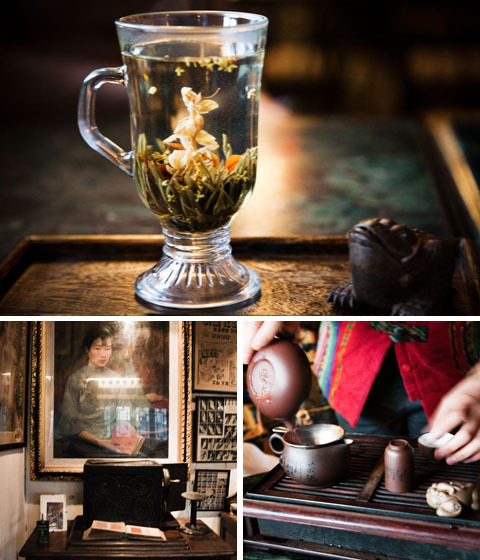 In the heart of historic Old Town in Shanghai and in close proximity to the famous Yuyuan Gardens lies the Old Shanghai Teahouse. In fact, Old Town was the first area of Shanghai to be settled – originally, a place for locals only and where foreigners never ventured. Today, with the Old Town Bazaar and nearby historic gardens this is hardly the case as a mix of foreigners and locals can both be found shopping and generally whiling away a Saturday or Sunday afternoon. 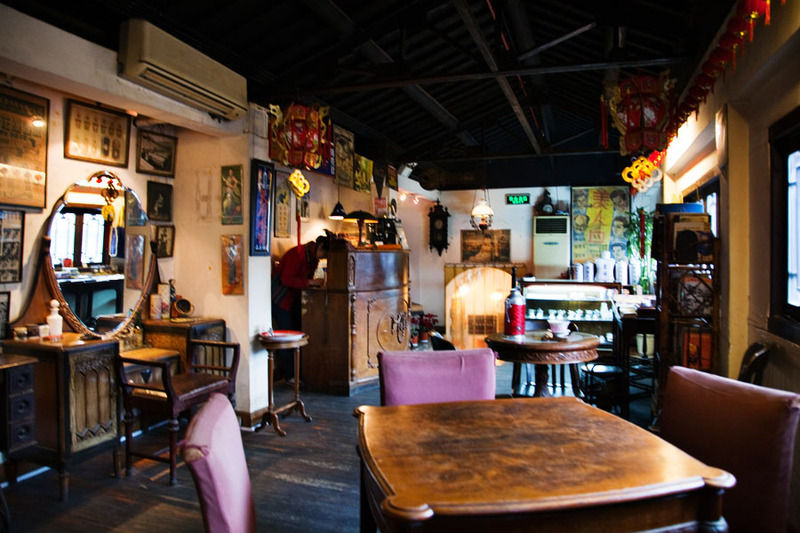 And in the midst of the market frenzy, the Old Shanghai Teahouse provides a welcome, if slightly eclectic, respite. The quirky décor reminds me of an assortment of items you might see at an American flea market. But this is exactly the charm of the place. 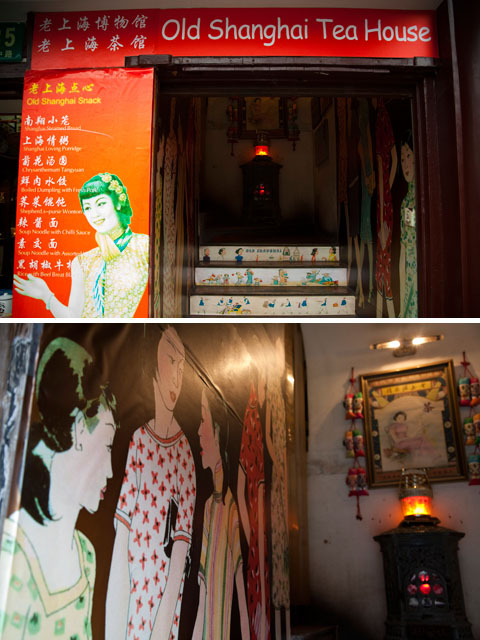 Full of relics from the 1930’s and 1940’s it is part cultural curiosity, part tea house. 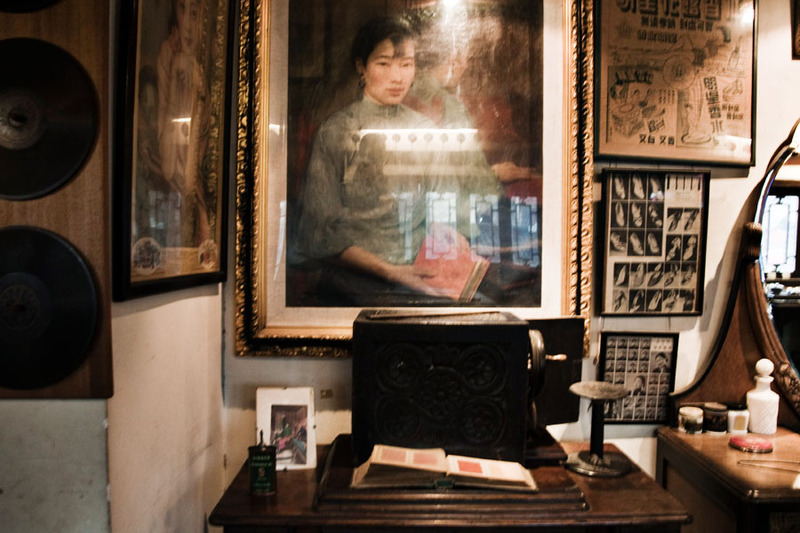 From an actual map of Shanghai in the 1930’s and old sewing machines, to period posters and old phone books, there is a fascinating assortment of oddities that provides no end for visual amusement. I confess – I am a former coffee addict (several cups a day, headaches in absence of coffee…the whole nine yards). However, I have almost completely switched to tea as of late and have a burgeoning curiosity about the world of Asian teas and tea ceremonies. 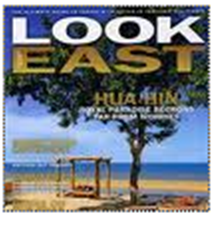 And perhaps nowhere is tea more revered than in China. That said, I am still learning about all the different varieties, so we relied on our host to help us navigate the menu. Our host was in fact quite knowledgeable about the various teas and helped us select a couple to fit our individual tastes. Paul opted for the Guang Yin Kung Fu Tea. As it turns out this classic oolong tea has a propensity for bitterness, so rather than being steeped in a large teapot it is normally only kept in a mini teapot for 20-30 seconds before serving. 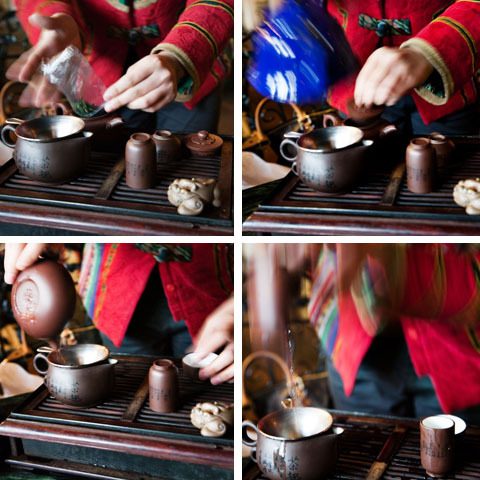 The serving of tea leaves was large – allowing for multiple fillings of the tea cup and prolonged lounging (65 RMB / $9.50 USD / S$13.50). I have a penchant for Jasmine tea, so wanted to try something in that area. Our host guided me toward the Shanghai Baby Jasmine Tea (65 RMB / $9.50 USD / S$13.50). This tea is served in a special glass cup because watching the tea steep is half the enjoyment. This is because the tea is in the form of a dried Jasmine blossom compressed into a ball shape. When the dried Jasmine blossom ball drops into the hot water it slowly unfurls in the glass cup. Paul and I stared with fascination at the flower and leaves blooming – in the end it was like a miniature aquarium feature. And the tea itself was exactly what one would expect – a delicate floral perfume that was both soothing and refreshing. All in all, it was a great detour during our morning of shopping and exploration. The combination of the 1930’s time warp décor and the calming ritual of a Chinese tea ceremony made for a truly unique experience in Shanghai. IT’S MAGIC!!! FANTASTIC PICTURES. WONDERFULL!